The Best Camping Knives Today! Which is the best camping knife to buy in 2019? Though an easy question to ask, the absolute answer to it can only be achieved through a thorough testing and comparison process. Even then, the answer is not always that absolute and error-free. That is why we researched and tested twenty of the best camping knives in the market then narrowed down to the absolute best in our list below. In this list, we highlight the features that make these knives unquestionable in the world of camping knives. Let’s get to it. Which is the best camping knife? With an overall length of 11.875 inches and weighing 11.2 ounces, this knife from KA-BAR has just the right combination of sharpness and comfort. Its blade, measuring 7 inches, is razor-sharp and is even easier to work with as it sharpens easily. The blade’s metal goes all the way through to the base of the handle. Rat tail tang means that even though the blade goes all the way through the full length of the handle, the width deteriorates from the point of the knife to its handle. This feature however discourages applying pressure on the blade for heavy chopping as the knife is not as strong as a full tang knife is. In that way, its design is 100% around self-defense as opposed to heavy work. This knife has a leather sheath whose thickness keeps it protected and sharp. Its leather handle requires little attention in terms of maintenance as it is very densely packed. 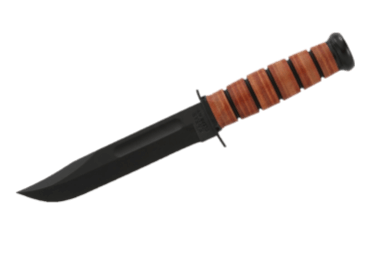 KA-BAR’s durability is guaranteed owing to its 1095 cro-van steel make. This feature is responsible for the edge retention of the knife. It also sports a gold-plated brass guard and pommel. This is in addition to it being endowed with a round handle that gives you a good grip avoiding any slippage. The USMC KA-BAR knife is a pioneer in the world of knives, having its ascent during the Second World War. Not only has it continuously been a knife of choice for US marines but also merely owning one enhances a sense of patriotism. Needless to say, KA-BAR knives, much like this one, are the portrayal of the innovative American craftsmanship. With excellent edge retention in addition to being durable, this knife is proven and solid. It is more of a cutting utility and combat knife than a prying and batoning knife. We had no qualms cutting through ropes. For that we rate it at 4.7 stars. With an overall length of 10 inches and weighing 15.2 ounces, this full tang camping knife from Gerber balances decency with multi-functionality. The half serrated blade it sports is great for cutting ropes and other fibrous material. It is hosted by a sheath that has extra features that increase this knife’s functionality. These features include a fire steel, whistle and sharpener; all of which are easily removable from the sheath and fit in back into the sheath just as conveniently. Admittedly, this is the most dominant feature of this knife and single-handedly makes it surpass other knives in terms of functionality. Compared to other Gerber knives, the Gerber Bear Grylls handle is made of softer rubber giving it comfortable grip as the texture prevents sliding. The handle features two holes where you can attach a stick and use as a fishing spear. Made of hard stainless steel, the blade is extremely sharp, holds an edge and easily sharpens back to quality. The edge retention and durability accompanying this knife is nothing short of exemplary. Stainless steel heavy gritted pommel located at the base of the handle which can be used as a hammer is a gallant feature of the Gerber Bear Grylls. 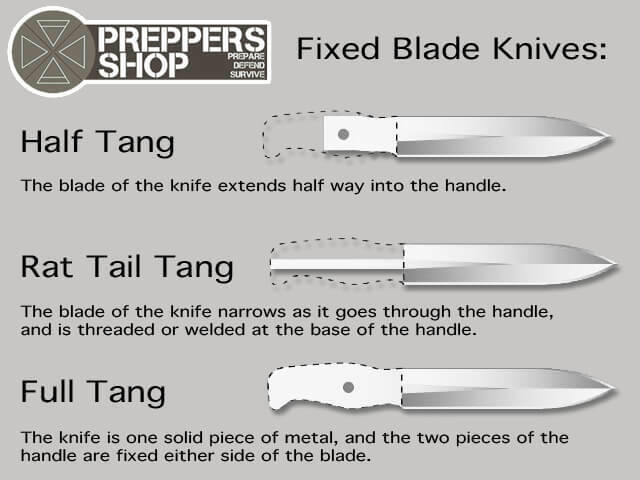 If you want to establish that this knife is indeed made for outdoor survival, consider the “Priority of Survival” guide that it comes with. Listed on the guide are all the pro-tips you need for outdoor survival. Not forgetting the fire steel that works magic by creating sparks when fused with its blade. Don’t shy away from this celebrity-branded knife, it is definitely high quality and greatly functional. For that, we rate it at 4.5 stars. Attached to the sheath is a sharpener, great at maintaining the quality of the blade as well as a whistle that works well enough if you want to attract attention. Mtech USA Xtreme MX-8054 Series fixed blade tactical knife hosts a tanto blade and a G10 handle. It measures 11 inches overall and weighs 1.1 pounds. You can choose either the black or the black and gold. The knife features a blade that is 5 and half inches long, 5.5 mm thick and made of 440 black stainless steel. The grade 440 stainless steel is attributable for the blade’s wicked hardness and excellent edge retention as it contains more carbon. Made of thick high grade material, it is a perfect blend of a knife with strength and durability. The black G10 handle encompasses finger grooves which enhance control over the knife in addition to giving you a comfortable grip. The groove and saw back feature adds to the knife’s cutting power. Other than being comfortable, the grip remains within your control even in extremely wet conditions. For added protection, the knife features an extended guard that protects your fingers from the blade. Lanyard hole at its base allows you to hang the knife around your neck. For easy and safe carriage, the knife comes with a nylon sheath that includes ties for more security. Even then, this material is not as durable as a leather sheath. Weighing 11.2 ounces and made of 420 high carbon stainless steel, this knife is robust and sharp. With it, your grip is secured as its handle is made of diamond-texture rubber. Its blade length being 4.8 inches and an overall length of 9.8 inches, you can pick either the black or the coyote brown it comes in. It has an exemplary sheath system that is multi-mount and snaps together. You can either mount it vertically owing to the snap-in Molle strap, on the hip or horizontally along the waist line through the detachable belt hoops. This material accounts for the blade’s strength. The ceramic coating of the blade further serves to enhance durability of the blade by preventing corrosion. The sheath is of quality and well-finished featuring thick nylon webbing. As for design, even lefties are accommodated. It allows both left-handed and right-handed insertion of the knife into the sheath. Wet or dry, there is no chance of the handle slipping from your grip. At the base of the handle is a striking pommel, functional for breaking through hard surfaces. For the simplicity of the design, this knife is remarkably lacking in nothing. Then there’s the ambidextrous sheath that adds to the value of the knife. It gets 4.7 out of five stars. This knife’s blade is 6 inches long while its overall length is 10 and a half inches with a weight of 7.5 ounces. Robust as it is, this knife has excellent edge retention, it is easy to sharpen, resistant to corrosion and hardened to standard owing to the Paul Bos heat treatment it is subjected to. It won’t break easily even after throwing. The blade cuts well through paracord and can also be used as a fishing or hunting spear or even for skinning. The edge is excellent right out of the box. You can do just about anything with it whilst it retains its edge. Its handle is phenolic alongside an aluminum pommel guard. The knife sports an excellent point, a great handle that feels good in the hand with an all-weather grip as well as a pommel for hammering. The knife sports a classic hardwood handle with accentuated palm swells giving you a comfortable grip. Although not visible due to the wood covering the handle and brass ending, it has a full tang with a nice feel to it. This knife models a high quality leather sheath that keeps the knife protected and convenient to carry. Its size makes it perfect for skinning deer. The 6 inch blade is easy to use and has little to no chance of cutting yourself. This aesthetically pleasing model scores as one of the best in the field of hunting knives. From simple camp chores to game preparation, the Buck 119 is fit for every adventure! We rate it at 4.8 out of five stars. If your knife of preference is a folded one or your activity of engagement calls for a folded blade, we have assembled five of the best folding knives for camping below. Designed by retired professional soldier Kit Carson, the CRKT M16-13T EDC folding pocket knife features a dual blade having a plain and triple point serrated edge. Its blade is 3.5 inches long while the knife is 8.25 inches long when unfolded and 4.75 inches long when folded. You can pick the Aluminum bead blast, nylon-bead blast, nylon black, stainless black or the tan nylon and the titanium bead blast from this knife weighing 3.4 ounces. The M16 series blade is made of AUS 8 stainless steel working excellently for edge retention and durability. The razor-sharp blade also has a non-reflective fine bead-blast finish to it; the steel appropriate for rough cutting chores. To open, it has CRT’s exclusive patented AutoLAWKS safe which automatically locks the foldable blade into a fixed position when opened. This bars the locking liner from accidentally releasing when the knife is locked. Convenience extends to the easy one-handed closing. Backed by an added security system for the locking liner where basically locking the knife entails pulling the red buttoned safety lever backwards, sliding the locking liner over and resulting in the blade being folded in a closed position. Evidently, with this knife your safety comes first. Even more accommodating is the locking system which entails two-thumb studs convenient for ambidextrous opening. For easy carrying, it features a removable clip which can be attached on a pocket for sustenance. The strength to weight ratio is exemplary with a handle that’s CMC machined from titanium. This material balances the strength and weight of the knife more compared to steel or aluminum. The titanium frame the knife encompasses is minimally finished with ceramic bead blast, resulting in a comfortable grip. Efficiency and security are promised with this knife that hosts a Carson flipper extension to its blade, aiding its opening tasks and preventing one from cutting themselves amidst the task. The M16-13T has a slim profile, itself an addition to the spear-point tip for its blade, giving room for easy and a surplus of carriage means. The handle is unyielding to almost all conditions and is easy to clean. The ergonomic handle further has an open design that deters dirt from getting trapped inside it. Engineered to the highest standards with an innovative rear lock, this is an everyday knife. With a lifetime warranty that covers any defects throughout its ownership, this knife earns an awesome 4.5 out of five star rating. The OG-220S Rapid Fire wins the award for strength. Carefully designed through cryogenic treatment, the knife is left tough with extra wear-resistance, sharp edge and increased corrosion resistance. The knife, treated to -300 degrees, inhibits easy edge-chipping. The blade is 3.75 inches long and 1.25 inches wide at its widest point and weighing an overall of 5.71 ounces. This knife has a combo of a serrated and plain edge. It features a cryogenically treated razor-sharp blade steel with serration that can even be used to shave. The fine edge is immaculately sharp whilst the serrated half cuts through rope with exemplary ease. You will have no trouble sharpening it and will be left with a sharp edge. As the name denotes, the rapid fire knife has a lightning-quick releasing, ambidextrous one-hand system through either the flipper trigger or the dual thumb studs. It has a large FRN handle with an unwavering grip made of fiberglass reinforced nylon scales. The strength of the handle is proven with how hard to break it is, resistance to abrasion and an all-weather grip. The rapid fire steadfastly remains locked and loaded. Its design also allows you to change the clip to four different positions. The all-position mounting clip can be tipped up, down, left or towards the right. All this is in addition to a lanyard hole for easy carriage. It has a thin profile allowing it to easily slip in and out of your pocket. This knife hosts a jimping & ; flipper lever which unloads the rapid fire blade when the flipper is pulled back. Grip performance is further enhanced by a textured thumb placement point that holds your finger in position. This off-grid knife is very well made, with a four-position clip perfect for any carry position, razor sharp blade, solid grip handle, and excellent flipper release. It earns 4.7 stars. Although comfortable, the grip is slippery. 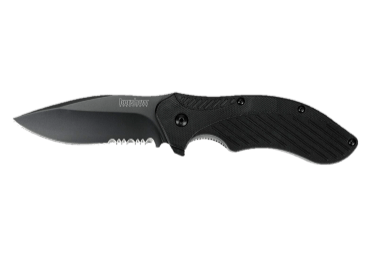 Kershaw’s black clash is a 3.1 inches blade succumbed to high-performance heat treated 8Cr13MoV stainless steel responsible for its toughness and edge retentions along with wear resistance. The knife can withstand both abrasive and adhesive wear. Weighing 2.4 ounces, this knife has a drop-point blade that is partially serrated making slicing fibrous material an effortless task. With its drop-point sharp blade, it is undisputedly the best folding hunting knife. Its stainless steel blade with black-oxide coating is not only appealing but also non-reflective. More importantly, the coating deters corrosion. It has a glass-filled nylon handle that is comfortable and gentle on the hand and offers a solid grip. This knife’s Speed Safe opening system is fast, smooth and secure, done by applying pressure to the flipper. With that, the blade unloads and automatically locks into place. For added finger protection, the thumb stud remains in place after smooth instant opening. Need I mention that this whole operation is smooth and one-handed? As aforementioned, the blade automatically locks into place. Its security therefore is maintained through as a liner locking system whereby a lock-bar is backed towards the blade’s back to prevent closure then angled towards its tang to maintain its position there. The locking liner secures the blade. True to Kershaw designs, you are privileged with many carrying options due to a reversible pocket slip that it comes with. You can adjust the clip to carry the knife tip-up, tip-down or according to your side of preference. User convenience in carrying it was definitely in mind while constructing this knife. You want a solid, reliable, easy to open and carry EDC knife? The black Clash was undeniably made for you. Evidently, this top-notch knife is light but substantially built hence we give it 4.7 out of five stars. Weighing 3.2 ounces, the Spyderco tenacious folding knife is sharp right out of the box. The blade is 3.39 inches long while the whole knife measures 7.76 inches long. Similar to the Kershaw Clash Black Knife, it sports an 8Cr13MoV stainless blade with a non-reflective black coating. The coating holds up even after lengthy use. From its spine to its cutting-edge, it is ground-flat ideal for smooth uninterrupted cutting. Blade opening and locking is enhanced and secure courtesy of the solid liner lock with no risk of half-engaging or falling back regardless of how fast or slow you open it. This procedure is satisfactorily smooth as well. You can work with this knife for prolonged periods without getting fatigued due to the skeletonized steel lines within the handle that increase its rigidity and strength. All this, with no extra weight that overbears your hand as the large holes reduce on weight. The opening is further ambidextrous as the Spyderco hole is large enough to accommodate both left and right hand management. This knife wins with respect to the cutting edge. Its sharpness traverses the entire blade, from its tip to its hilt. It also features a four-way pocket clip, adjustable for tip-up, tip-down, left or right hand carriage. No folding knife can compare to this steadfast knife with an exemplary cutting edge. Great for mundane activities as opposed to self-defense, it earns 4.5 out of five stars. With a blade length of 3.82 inches, thickness of 0.160 inches and overall length of 8.70 inches, this folding knife comes in an array of colors; plain edge with a black handle, plain edge with a sand handle, serrated edge with a black handle, serrated edge with a sand handle. The drop-point blade is a quality knife made of D2 stainless steel that has great edge retention. The quality extends to the G10 handle which is stable enough to survive through various temperatures. This knife’s strength comes from the blade’s thickness. The knife weighs 10.4 ounces, alongside the G10 handle scales. 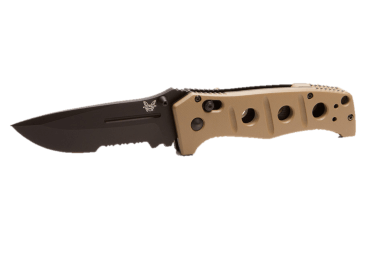 Benchmade’s AXIS locks extremely solid, is fully ambidextrous and only requires single-hand operation. Although rugged, it is comfortable to hold and use. More pleasing is the clip that comes tip-up oriented but is reversible for four-way carry. With a lifetime warranty, there is really nothing like this manual knife. We rate it at 4.7 out of five stars. The harder the steel, the stronger a knife is. Stainless steel can be sharpened and does not corrode easily and stays sharp. If your activity is more demanding, opt for high carbon steel as it is very strong and you will not have to sharpen it often. Blades usually have a combination of either carbon, chromium, silicon, manganese, vanadium, molybdenum among others. While carbon increases hardness, chromium increases wear and corrosion resistance. "Stainless steels" denotes an addition of chromium and reduction of carbon content. They are numbered according to the alloy convention that constitute it. For instance, 420HC means that the blade is made of high carbon and chromium content. Not to be confused with 420 stainless steel, this combination makes for good abrasion resistance and edge holding. However, this can make it difficult to sharpen. Knives are usually submitted to a Rockwell C scale (HRC) to determine their strength. All in all, a knife made of high carbon steel is far more rewarding than a stainless steel as it is harder and easier to maintain. 2. Fixed-blade knife or folding knife? If you are just walking on the trail or hanging around the campsite, then a folding knife will do. However, fixed blade camping knives have the upper hand owing to their strength and safety. They have no chance of folding back and cutting you. Folding knives, even the ones with a locking blade, may fail and result in serious injury. Other than accidentally folding, they may also break completely or clog; none of which is convenient. Although an axe or saw would be ideal for hard activity like batoning, a fixed-blade knife would be a good alternative if you need a tool that is easy to carry. The longer a knife is the better it is for this activity. Fixed-blade knives, because they have no moving parts, are stronger than their folding counterparts. You want a knife that will be strong enough for cutting up wood or slicing food. You want a knife whose blade goes all the way through the handle. They are harder to break, stronger and more durable. Three to four and three quarter inches is advisable. It is neither too long nor too short. So pick a knife around this length. This is the ability of the steel of a blade to hold its edge without frequent sharpening. You will want to reward yourself with a camping knife that won’t keep bothering you every other time with blunt edges. Consider a handle whose material gives you a good grip such that you still have control over the knife even if you are working around water or simply sweating. As for its shape, a rounded handle is more preferable. They are more comfortable and reduce your risk of getting blisters while cutting. 7. Serrated edge or non-serrated? Serrated knives may be more appealing to the eye but a straight one is more effective. There’s nothing you can do with a serrated knife that a well-sharpened straight knife cannot do ten times better. Serrated blades, apart from being disadvantageous at a camping site, are hard to sharpen. If anything, the major length of the blade’s edge should be straight rather than serrated if it is to be a good camping knife. The type of sheath is important to consider because a knife will only serve its purpose depending on your ability to carry it. Leather sheaths, albeit being an effectively protective layer, enhance corrosion. The best sheaths are made from Kydex, a heat-molded plastic that retains the blade by pressing shut over its top. A safer alternative is a sheath that holds the knife below your belt. This will prevent an accident such as breaking your ribs or damaging your organs in case of a fall. You want a knife with a flat top to the blade as opposed to a double edged dagger, as this provides a good striking surface for batoning. It is easy to overlook the weight of a knife while purchasing it. However, the toughness of a knife can support hard impact without damage. Look for a blade with extra thickness and weight as it is going to be strong enough to cut trees with. A hefty knife is the better choice for a minimalist camper. Lastly, avoid a knife that is ‘multi-purpose’. They have a lot of features such as a bottle opener or a compass but these features only distract the knife from effectively serving its purpose. A knife has a plethora of capabilities that are enhanced by your skills and its strength, not the additional features. Its importance cannot be emphasized enough. That said, if we were to choose a knife for you, we’d go for a fixed-blade knife, about four inches long, of medium weight, with a straight edge and made of stainless steel.